I decided to pick up a charity-shop copy of Pirates of the Caribbean: The Curse of the Black Pearl (2003) as research for my comix, only intending to watch the first half hour or so, to get a sense of the setting/period… but then I got drawn in by the story, characters, and jokes all over again, and ended up watching all the way through to the post-credits punchline! Before the movie was actually released, it was easy to be cynical about its prospects, both creatively and financially… I mean, who could’ve predicted that a Disney-financed pirate comedy based on a theme park ride would actually turn out to be so strange and exciting and spooky and funny? It could’ve so easily turned into a Cutthroat-Island-esque fiasco… but somehow, through a process of inexplicable alchemy, swashbuckling gold was spun from the straw of corporate synergy! Of course the main draw here is Johnny Depp’s multi-award-nominated turn as the series’ adorably off-kilter hero, crazy-as-a-fox ‘Captain Jack Sparrow’, and everyone else sort of fades into the margins around him… though Geoffrey Rush’s ‘Captain Barbossa’ does make for a very sympathetic villain, and I was even a little sad when he died (though I knew this wasn’t the last we’d see of him…). Sadly, while ‘Elizabeth Swann’ (Keira Knightley) showed a fair amount of moxie and ingenuity in the face of adversity, she was also a bit bland and generic as far as female leads go. 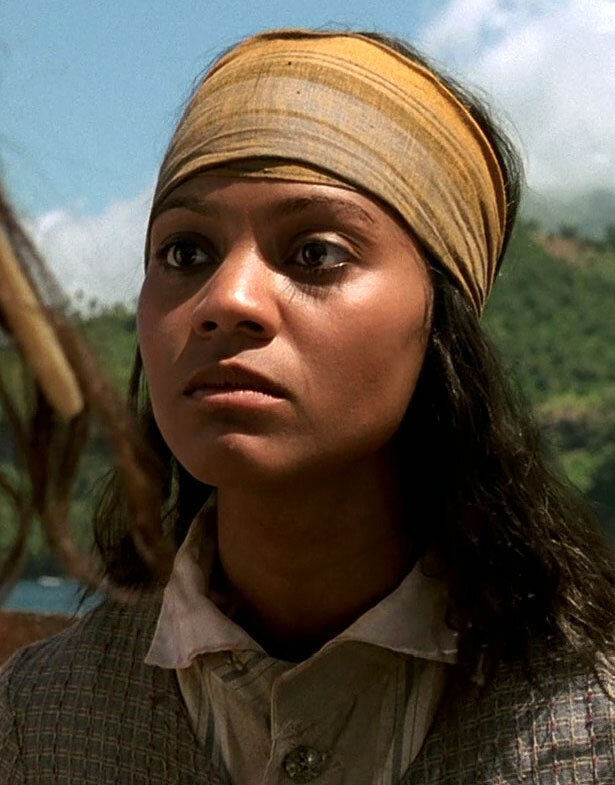 Then again, I’d say the same for her love interest, ‘Will Turner’ (Orlando Bloom), so I don’t think it’s a gender issue so much as a not-being-Jack-Sparrow issue! Needless to say, she did not return for the sequels… which I now feel compelled to buy/watch, despite remembering what a drag they were the first time around. Ack!! This entry was posted in Rants about Films and tagged Anamaria, Elizabeth Swann, Keira Knightley, Pirates of the Caribbean, Pirates of the Caribbean: The Curse of the Black Pearl, The Curse of the Black Pearl, Zoe Saldana. Bookmark the permalink.